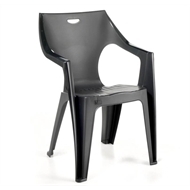 The Kreta low back chair by Marquee sports an ultra modern contemporary design with curved lines and moulded back support. With a durable weatherproof resin construction that is mould and fade resistant, and anti-slip rubber on the chair leg tips, they offer excellent stability and grip on a wide range of surfaces. The Kreta low back chair is compact, lightweight, highly portable and stackable, making it the perfect choice for entertaining or as extra seating in your outdoor spaces.